People who know their online communications are being monitored by government authorities, are less willing to voice dissenting opinions, an empirical study concludes. The thought of being watched increases people's tendency to keep their political views to themselves when they disagree with the majority opinion. Such self-censorship undermines an open, democratic debate, the author warns. To examine the influence of mass online surveillance on the expression of political views, Elizabeth Stoycheff, Assistent Professor at Wayne State University, Michigan, USA conducted an empirical study. The paper with her findings is published in the Journalism & Mass Communication Quarterly, and freely available until April 30, 2016. The general public became aware of the existence of mass government surveillance in the summer of 2013, Stoycheff recounts in her paper. Whistleblower Edward Snowden leaked a cache of classified documents which describe clandestine programs such as PRISM. 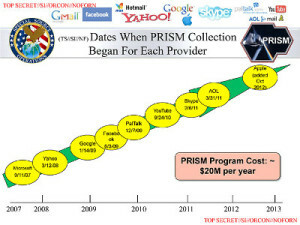 PRISM enables data collection "directly from the servers" of tech giants like Microsoft, Google and Facebook, the National Security Agency boasts in the documents. In the months and years following the Summer Of Snowden, the trove of documents was the source of a steady stream of revelations about government surveillance programs and techniques. By 2015, 87% of Americans was aware online communications are intercepted and stored by the U.S. government, writes Stoycheff citing a survey of Pew Research. That same survey found 57% of Americans say "it is unacceptable for the government to monitor the communications of U.S. citizens".